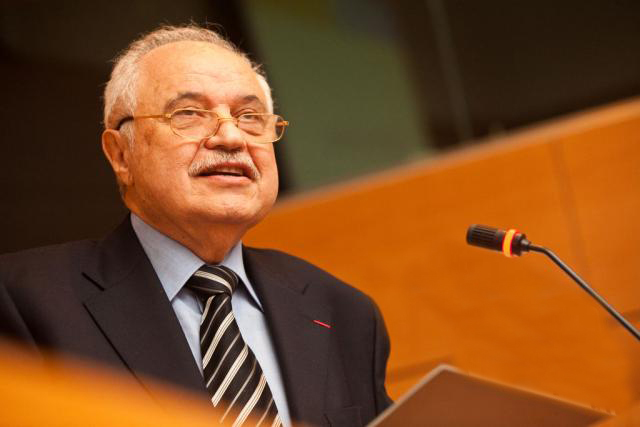 ROME - Dr. Talal Abu-Ghazaleh, chairman of Talal Abu-Ghazaleh Organization (TAG-Org) discussed 'The Road to Success: IT for IP' at LES Pan European Conference 2012 with the participation of IP practitioners and industry professionals from all over the world. The June 10-12 event hosted by Licensing Executives Society Rome (LES Rome) and held at Parco dei Principi Grand Hotel & Spa in Rome focuses on the Intellectual Property needs of large corporations as well as small and medium-sized enterprises and brings together leaders from the world of business and finance to discuss the importance of IP Rights as a driver for economic growth and development. In his keynote speech to the LESI Young Members Congress (YMC), Abu-Ghazaleh introduced how a small company in 1972 that started with only 10 employees grew to become Abu-Ghazaleh Intellectual Property (AGIP), a global leader operating out of 70 offices of its own with 900 staff and over 100 representative offices throughout the world serving over 70,000 clients and stores 800,000 registered trademarks and patents in its data base. The LESI Young Members Congress (YMC) is an initiative created to meet the networking and professional needs of young executives under the age of 40 interested in the business of Intellectual Property, including licensing, sales, valuation and investment. "Still AGIP has more plans and if you wonder how we did it? Well, like all the other leading firms, we are proud of the quality of our services, the integrity of our staff and are very protective of our brand. Our IP firm is managed as an IT firm which provides IP services. Our ICT state- of- the- art digital programs, constantly being developed, enable us to continue to provide our clients with services that meet our clients’ continuous expectations for better services," Abu-Ghazaleh, President of Licensing Executive Society-Arab Countries (LES-AC), said. Abu-Ghazaleh who was inducted to the IP Hall of Fame in 2007 stated some milestones in the life of AGIP which received Middle East IP Firm of the Year Award for the sixth year in a row by Managing IP Magazine, TAG IP dictionary was published in 2000 and the first IP news agency Agip news was established in 2003. Abu-Ghazaleh who was recently selected to the WTO panel of experts representing the global stakeholders commissioned to review and address challenges to future trade pointed out that AGIP is planning to become an IP Knowledge Age Firm. The LES Pan European Conference 2012 has been designed specifically to explore the role of IP as an essential asset for businesses in the 21st Century.